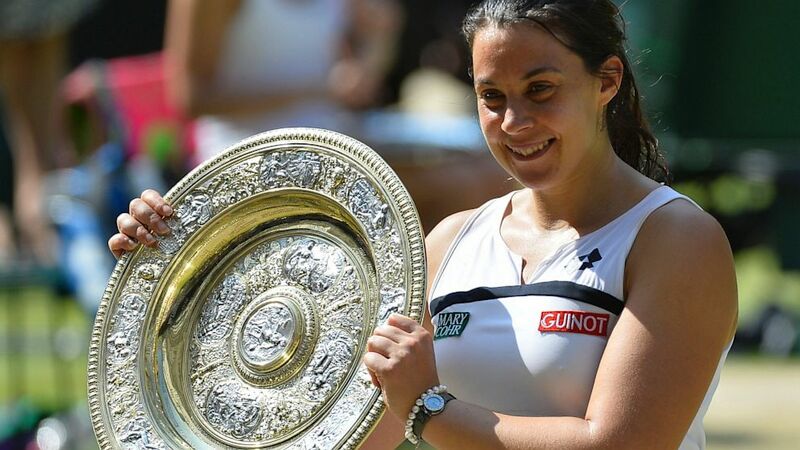 A dream that lasted two weeks was the one that just ended with the best possible finale for Marion Bartoli. The 28 year old French woman was playing her 47th Slam of the career and clearly wasn't among the faves when the tournament started despite having been on a Final on the most famous grass of the world once before, in 2007, when en route defeated Justin Henin before falling to the hands of Venus Williams. Her run that year came as a surprise and despite having shown to be a top player through the years she never reached a slam final again before this week. Marion capitalized a draw that surprisingly fell apart because of upsets and injuries, with her half being deprived of Sharapova (l.t. Larcher de Brito in R2), Azarenka (injured, w/o to Pennetta in 2R), Wozniacki (injured, l.t. Cetkovska in R2) and finally Kvitova, the only Wimbledon champion left when the quarter finals were set, who lost to another dream-runner, Kirsten Flipkens from Belgium. one, it was everything buy easy, because some of the players she had to take down are always dangerous on grass courts as it was the case with Italian Camila Giorgi, who recently had also defeated the French woman in Strasbourg. It was impressive, nonetheless, that Marion lost no sets on her way to the title, edging past some tough battles like the one against Sloane Stephens in the QF, when rain and public seemed to be against her as much as her opponent, but through her experience she could stay calm and take home what eventually happened to be the toughest of her battles in the late stages of this tournament, because in the Semifinals she looked like the only player on court. Flipkens was at her first Slam Semi and the big stage reached thanks to the huge upset over Kvitova seemed to block her rather than pump, so that in no time she was sent back to the shower by the powerful and accurate strokes of Marion which led to a 6-1 6-2 final score. In the Saturday's final she was facing the girl that was then said to be the favourite for the title, German Sabine Lisicki, the first German to reach a slam final since Steffi Graff in 1999. "Bine" made a terrific run to reach the final by defeating last year winner and current world n°1 Serena Williams in the 4th run and last year's finalist Agnieszka Radwanska in a tight semifinal ended 9-7 in the third. But if bookmakers were giving her the favourite, tennis fans knew that the biggest enemy for a German win was Sabine's own mentality: the German, despite the huge talent and perfect game on grass had never been that far of a slam and often has been proved to be mentally frail whenever it was about seizing a great chance. And the same happened yesterday. Despite the early break that sent the German 1-0 up, she looked tense on court and immediately Bartoli started to play her aggressive and powerful game that completely crashed Lisicki, like a typhoon does to a raft. 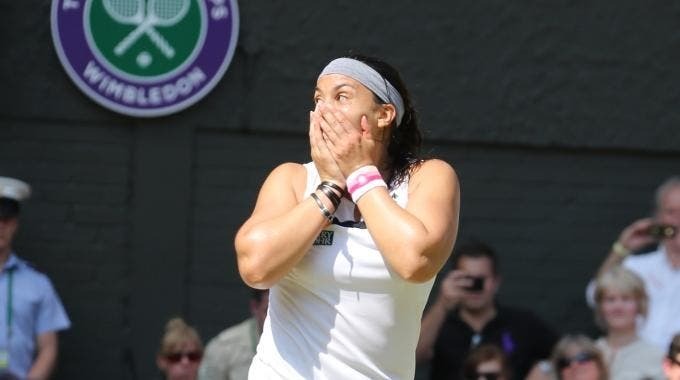 The more the match was going on, the most Bartoli looked confident and her shots heavier, while Sabine's serve started to go missing and every service game of hers was in jeopardy. In no time it was 6-1 for the French player. A toilet break seemed to help the German to find little of her game back as she finally held for the first time in the match for a 1-0 lead in the second set and the very tense and long game that followed was crucial for the final result, because Sabine tried everything to break and re-open the match, but every time she had a chance for a break, Marion could raise her level and save, until after almost 10 minutes she hold and on the burst of confidence go fast up 5-1, while tears and sighs broke on Lisicki's face. When everything seemed to be lost, 15-40 down on her serve, the German suddenly found the calm of the despair and saved 3 match points before holding and go back on track. Marion the felt little tight and the weight of the wasted chances took their toll in the following service game when with no chance to serve it out she got broken by the German, who kept her momentum going as she hold for 5-4. Marion was then sent to try serving for the tournament again, but this time she didn't let the chance leak out of her hands and with a terrific ace -only the 2nd of her match- that lifted a small cloud of gypsum from the green grass of the centre court she finally could fall on her knees and let the joy for the first slam of her career flow. With this result Marion will be back in the top 10, as high as 7th, which is her best ranking...what's more, she is the first player with double-handed forehand and backhand to win Wimbledon.